Silicon Valley escapees Paul and Sui Yi Mason started out with a nauseatingly familiar story. Paul, a chemist, cofounded a startup that developed a microchip which takes the "thumbprint" of organic compounds and analyzes them with software. He sold his share at the market's peak, and took early retirement. Avid wine collectors, the Masons delved headlong into their new Sonoma lifestyle. Truqué is located in a remote industrial park. Surrounded by machine shops and warehouses, the only indication that I'm at the right place is a pair of scraggly grapevines in planter barrels. Mason pokes his head out the door: "I see you've found the vineyard. Ha ha ha!" Mid-40s, with spiky, graying hair, Mason moves around the lab with a geekily youthful enthusiasm, pouring tastes from test tubes. At first, the couple worked a harvest at a local winery. They weren't impressed. "For me, it was the earwig bugs—thousands, all over the grapes. And one time, a dead bird! I was like, ick!" Sui Yi shudders. All in all, it seemed like a lot of mucking around. Mason decided to go back to his roots, and make it the only way he knew how: in the laboratory. Mason starts with a bulk wine base—sometimes bargain appellation throwaways—clarifies it, then adds flavoring compounds, pigments and stabilizing agents to approximate the diagnostic profile of the world's finest wines. To legally call it wine, they only have to print "with natural flavorings" on the label. "But it isn't soda pop," Mason says. "It's a challenge. It's just not a mystery when you take it down to this level." But what about craft, what about the unique terroir of the vineyard? Paul and Sui Yi collapse into well-practiced, comic gagging motions. "But seriously," Mason recovers soberly. "I respect winegrowers. They led the way. The farmers of Burgundy were early scientists, if you think about it; they observed, selected, experimented. These days, winemakers do all kinds of tricks they don't tell you about: acidulation, reverse osmosis, Franken-yeasts. I'm just taking it a step further. OK, maybe two." Truqué's 2006 Thompson Seedless Chardonnay ($15) has toasty, buttery, baked-apple hallmarks. It's realistic, and I wonder, is the concoction barrel-aged? Mason rattles off a list of compounds: "Diacetyl, trans-methyl-octalactone, cinnamic acid, a dash of methyl furfural. Same result." 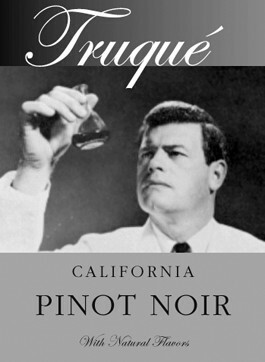 The 2007 California Pinot Noir ($20) has a brash nose of black cherry, cola and over-the-top clove. It's too much; everything in the book. For the 2007 Russian River Grand Truqué ($35), Mason went further. He was beguiled by the smoky bouquet of his favorite Romanée-Conti, and it eluded him—for weeks. Then he nailed it. It turned out to be an off-the-shelf ingredient used mainly in ballpark franks. "I get it from a lab in New Jersey," he says, swirling a beaker. "It's pricey, but a liter lasts me five vintages. Ha ha ha!" The wine has a delicate framboise nose with dried red cherries, damp earth, roast meat and bacon fat. If I didn't know it was a fake, I'd say . . . But, no! I don't want to give it that credit. If enchanting, silky wine could come not from terroir, but out of a beaker, what would tomorrow hold? Truqué Winery and Vineyard, 1 April Fool Way, Santa Rosa. Tasting by appointment only. If the phone rings, it's the future calling.